I took this picture yesterday from the Santa Monica pier. The weather yesterday was unbelievable...perfect for being outside and enjoying the California sun. A friend and I walked the pier, rode the ferris wheel, and rode tandem along the beachside bike path. It was a real California experience. 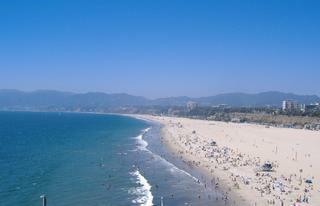 I saw thousands of Californians rollerblading, biking, and running along the beach in their bikinis and bare chests. It looked exactly like the California you see in movies! #1 I would not be caught dead in a bikini on rollerblades. #2 I wish my mom could be here to enjoy the beach with me. #3 Now I understand why so many people dream of living in California. Nicole, I love your picture of the beach and ocean. I have a similar photo hanging over my desk, only it's of Moonstone Beach on the Central Coast. I lived in California for most of my life and just moved back to Oklahoma, where I was born and raised and still have family. Do I miss California? Yes and no. I don't miss the sprawl and the building boom and high cost of living. But every month when I get an email newsletter from the Moss Beach Distillery at Half Moon Bay I think, oh, fritters! I'd love to be there today! Nicole, I love it, makes me want to be there. I too miss the good things about California. Things are good here. Got your message, my screen on my phone is broke so I don't have your number, if you call me again leave your number and I will call back. later.